A year ago, Neil Wolfe’s heart was three times the size that it should be. He had no idea it was one of the reasons he needed to buy new shirts, twice. That didn’t bother him as much as a lingering cough, his lack of energy and severe swelling in his legs and feet. They were all signs that his enlarged heart wasn’t strong enough to pump blood through his body. Wolfe’s cardiologist Laura Ford, M.D., was worried and sent him to the Millard Fillmore Suburban Hospital, and then to heart failure specialists at UR Medicine’s Strong Memorial Hospital, Upstate New York’s only comprehensive heart failure and transplantation center. “When I first met Mr. Wolfe, I told him your heart is very, very sick and the problem is beyond the point where oral medications were going to be enough,” said Himabindu Vidula, M.D., heart failure cardiologist. A high-tech heart pump, known as a ventricular assist device (VAD), would provide much-needed support until a new heart is available. Last December, cardiac surgeons implanted a HeartMate 3 VAD into his chest to improve his heart function. It is the most advanced VAD available and stabilized Wolfe’s heart, giving him valuable time to wait for a matching heart to become available. UR Medicine is among the top 10 sites in the country for VADs, which can serve as a “bridge to transplant” for people with advanced heart failure. Over the past 17 years, UR Medicine has provided mechanical support to nearly 600 heart failure patients who traveled to Rochester from across the state and Pennsylvania. The VAD improved Wolfe’s heart function and restored his energy. 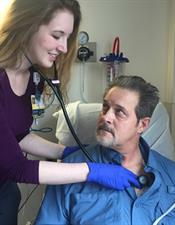 When he felt better, Wolfe, 57, was added to the waiting list for a new heart. Like a Scout, he was always prepared for good news about a donor heart. Wolfe and his new wife, Nancy, whom he married in April, planned to join friends on Conesus Lake for Labor Day weekend. They had all their “just in case” items packed, but were doubtful it would happen then. On Sept. 2, Wolfe received a new heart in a life-saving surgery led by Bryan Barrus, M.D., and anesthesiologist Wendy Bernstein, M. D., M.B.A. He is one of UR Medicine’s 241 recipients of second chances, thanks to the Gift of Life. Wolfe will tell you what he’s grateful for this year: a generous stranger. He thinks about that person’s family, their decision to donate his heart, and how lucky he is. The number of people who need organ transplants far exceeds the number of organs donated each year. There are nearly 10,000 people in New York who need an organ transplant, according to the Finger Lakes Donor Recovery Network, the organ procurement organization affiliated with the University of Rochester Medical Center, in partnership with other Upstate New York hospitals. More than 400 people are waiting for heart, liver, kidney or pancreas transplants at Strong Memorial Hospital. Recently the state introduced an online registration system, which is quickly increasing the number of people committed to donation. Go to passlifeon.org or donatelife.ny.gov to register. “I assure you I really like this heart and I plan to keep this heart as healthy as possible. It needs to last a long time,” Wolfe said.